The Arensberg Gemunder violin, complete with receipt from the firm of George Kappel, Pittsburgh, June 2, 1890 is a rare example of unbroken provenance for a fine art object. We can presume that the 1890 sale of this Gemunder in Pittsburgh was the first retail sale of this violin with a label dated 1889. 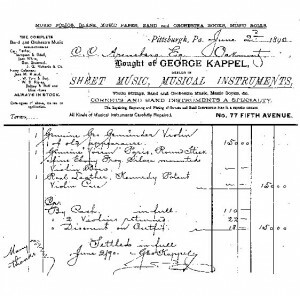 How the violin made it to Kappel’s Pittsburgh retail outlet is a matter of speculation, but it is well known that George Gemunder was a savvy and industrious marketer of his product. Likely, the Arensberg Gemunder was either consigned or sold to Kappel by Gemunder to be retailed. 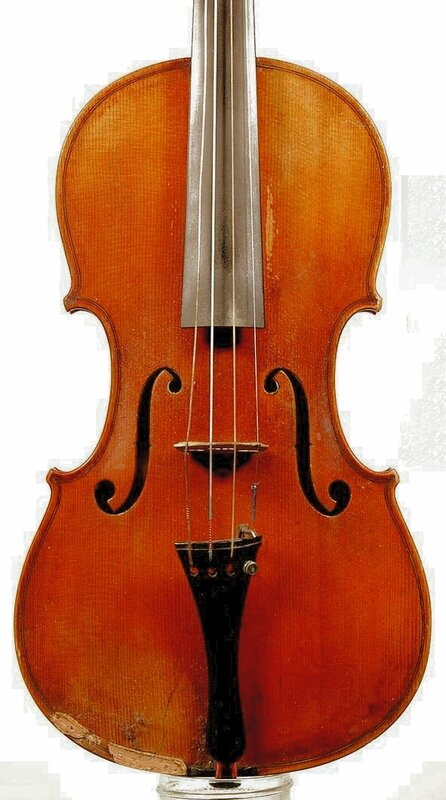 It was probably the best violin in the shop and as such it was sold with a bow by the best bow maker of the era, F.N. Voirin. The Voirin bow was still in the case with the violin when Charles S. Arensberg, a descendant of C.F.C. Arensberg, shipped the violin to Hersh Consulting Inc. for examination and valuation. The story is classic Americana from just over a century ago: an immigrant reaches a level of prosperity allowing for the purchase of the best make of violin produced in the domestic market. Said violin is used for amateur music making for many years and eventually handed down through several generations. Through luck and through the archival instincts of the descendants of C.F.C. 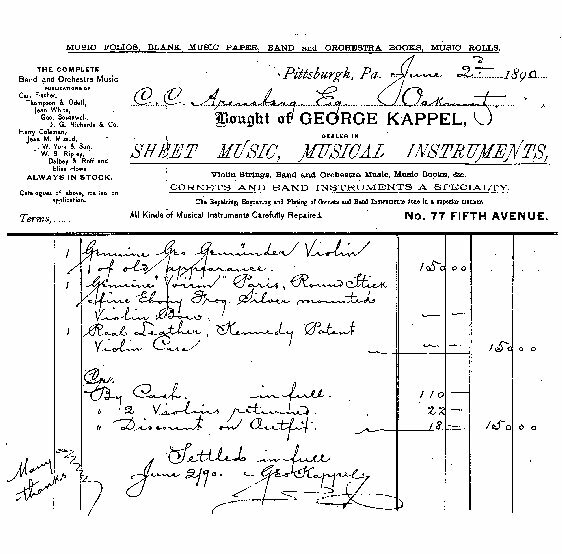 Arensberg, the original transaction is preserved for posterity in the form of a receipt for the original sale of the violin. 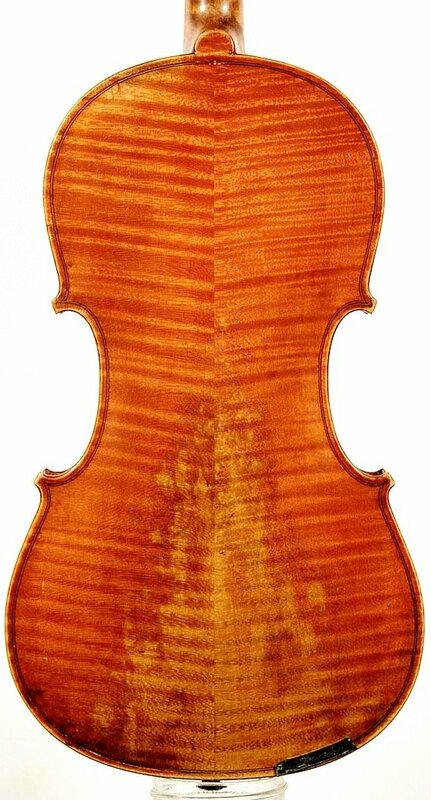 It is not at all surprising that the violin is in extremely pure condition today, as can be seen from the photos. With the help of Charles Arensberg we have included a biographical account of the Arensberg family, which sets the backdrop for the transaction around the Gemunder. The transaction between Kappel and Arensberg is probably typical of a great many such transactions in fine art objects from the last two centuries.